Melissa, a Girl Scout Ambassador from Topsfield, has a passion for working with babies and children. To earn the Gold Award, she worked with New Generation, a homeless shelter in New Hampshire for pregnant and parenting homeless women and their children. Melissa was dedicated to making the shelter feel like a home. She started by leading a team of workers in repainting five rooms. 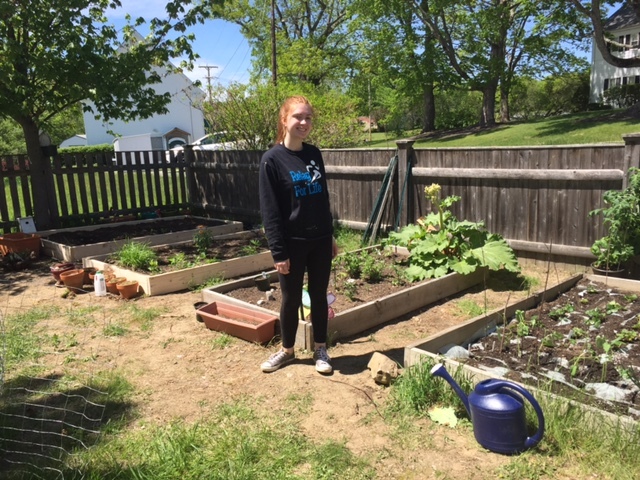 Melissa also renovated the garden by reconstructing and weeding the four overgrown beds, and planted seeds for fruits and vegetables including lettuce, beans, cucumbers, tomatoes, peppers, raspberries, and strawberries. She created an online sign-up calendar to give the residents and community volunteers opportunities to learn gardening skills and ensure the upkeep of the garden. Going even further, Melissa coordinated a collection of diapers, wipes, and baby food to stock the shelter for any of the women to access. She also created flyers and pamphlets for the shelter that detail the different resources available to women, which are posted at local doctor’s offices and other locations within the community. “Being a Girl Scout is putting others before yourself, allowing kindness and selflessness to shine through,” Melissa says. Your kindness is shining bright, Melissa!